A surprising change in the 'eye roller' public slogan of NOAA | Watts Up With That? NOAA’s Climate Prediction Center will release its initial seasonal outlook for the 2010 Atlantic hurricane season during a press conference in Miami. NOAA Administrator Dr. Jane Lubchenco will discuss the outlook with FEMA Deputy Administrator Rich Serino highlighting the critical need for storm preparedness. They will be joined by a diverse group of NOAA hurricane experts available for questions and interviews. Todd Kimberlain, hurricane specialist with NOAA’s National Hurricane Center is available for onsite interviews in Spanish. Media may also participate via conference call. Please call Susan Buchanan at the phoie number above to obtain the number and passcode. NOAA’s mission is to understand and predict changes in the Earth’s environment, from the depths of the ocean to the surface of the sun, and to conserve and manage our coastal and marine resources. Visit us at http://www.noaa.gov or on Facebook at http://www.facebook.com/usnoaagov. Is NOAA finally admitting they in fact don’t “know it all” or is this just a fluke from a copy writer with a conscience? I look forward to the next NOAA press release. May 14, 2010 in Government idiocy, NOAA, Uncategorized. Perhaps they’ve finally woken up to the derision that the old slogan used to generate. It made them look like a bunch of arrogant fools. Say no more. Funny how a couple of letters make such a huge difference. I think they got hit with a flavor of the month management craze and had to come up with a “Mission Statement” That sort of crock is all the craze in the “ISO” Government is always way behind on these management craze thingies. You must be getting bored. “Prediction” is easy. Accurate predictions, not so much. Does error in prediction demonstrate a lack of understanding the environment? They are located in Miamai? Maybe they can explain if Cuba is really gone as algore pic depicted or if the can still see it. maybe they can check on the counter rotating hurricane also before they go underwater. Slowly but surly they are backing themselves out of the corner they had painted themselves into. Or maybe they realized their “looking foolish” quotient would impact their ability to keep a snout in the taxpayer funded gravy boat. I feel bad about mocking the afflicted (so my mamma told me) but sometimes you have to call a spade a spade. The “groupthink” psychology gets entrenched when someone like Hansen uses their position and strong, insistant personality to lead and drive the movement. People see the writing on the wall and resistance is futile. It may still take a while, but no one likes to be ridiculed and someone will have to take the (early retirement) blame. Rubbing their faces in it should be done with class and subtlety. The high road is the best road to a happy ending. On the “zealot percentage of total staff” scale, NOAA is not so bad. Yeah, I know there are egregious exceptions. Well, ain’t that life? A useful change. Make it “NOAA’s mission is to seek to understand. . . ” and they’d get a thumbs-up from me. That is beautiful, very catchy! Mention the Earth’s geomagnetic field, and the connections between them all, and you’ve got a keeper. To boldly go where no science has gone before–though they should have, God knows. That way they get the straddle that politicians so dearly love. On the one hand, they express some modesty and please the skeptics with an acknowledgement of not knowing everything. On the other, they’ve got a broad wink in there that their understanding is already pretty darn good. . .just not “perfect”. And they get a little hommage to the US Constitution (and it’s “more perfect union” aspiration) too. Sweet! Oh, and I, Geo, hereby relinquish all IP rights to NOAA re use of the above suggested tagline. Thats a sustainable approach! Co2 McCarthyism didn’t work! Either way, they don’t. But I give them credit for finally admitting it. I guess it’s a start, or maybe is it just a typo? Predictions, are what got us into this mess. Damn it, now that “more perfect” allusion I made upstream has me singing the preamble to the Constitution in my head. I sincerely doubt that Lubchenko has become less arrogant when it comes to AGW bias. It is far more likely that administration insiders were getting a lot of flack for the “eye roller” as you put it Anthony. Here’s my prediction of their prediction. Why do they seek understanding for that which they already understand? Their “mission” is not to determine whether AGW exists, is or will be a problem, they already believe that. They aren’t skeptics. This observation by the great Danish physicist, Niels Bohr, seems appropriate. In fact, he made a number of memorable statements which seem to relate to climate science perfectly. Perhaps someone at this conference will ask them to explain why hurricane activity is at a 5000 year low? I guess most Climate Scientists at NOAA (and at RC) must have voted against this change. Obviously from their email exchange, they know it all and better than any other. Maybe with some more letters we can get NOAA administrator Jane Lubchenko; to repeat her experiment to prove that corals, and shellfish can grow in ordinary tap water that is dyed blue with a common laboratory blue dye. Except this time she should ask the Australian Embassy to send her over a few gallons of water harvested from the Great Barrier Reef, where we know for sure that corals and shellfish certainly do grow. So Jane; try dyeing that water blue with your ordinary laboratory blue dye, and then show us if it turns yellow when you chill it with a few pounds of dry ice. They realise they are not God. Or someone accused them of false advertising. Will they apply their new Carbon foot-print profiling?, that would be against our rights as CO2 exhalers. Niels Bohr should be required reading at NOAA. Apparently he is not. > Damn it, now that “more perfect” allusion I made upstream has me singing the preamble to the Constitution in my head. Right, and I’m going to get you for that! BTW, the next Klotzbach/Gray forecast from Colorado State will be out June 2. It goes into much more detail than NOAA’s. They’ll have to announce a different number, now that you’ve stolen their thunderstorms. We all need to understand the nature of bureaucracy. The first rule of any bureaucracy is to protect itself. geo, your too fast for me. Just dittoed my whole comment I had meticulously composed. By the way; How many days are left now for Gordon Browns tipping point? He annonced we had 50 days left? I have lost the count, and feel a certain panic growing now. I’m sure this Cameron fellow keeps track on the days left, so I will whatch the news all day long when the day comes. I’m sure there ill be an announcement from the british government. If they predict “changes in the earth’s environment”, do they publish how accurate their predictions were? I’d like to see them pressed for that data. And, as someone else pointed out above, if there is a failure to predict – there is a failure to understand. They need to be pressed for explanations for each failure to predict correctly since they supposedly understand. Is there a scorecard of past predictions? I wonder if there is a crossover between astrology and climatology? I’m talking serious peer-reviewed astrology here, not junk science. I found this amusing. I wonder if Al Gore will? Perhaps all the Polar bears will not float away after all. I think the change in wording is the result of millions of monkeys typing on millions of typewriters… this is eventually what the Head Monkey decided to use. I also bet that the people who did that devoted not one brain cell for one nanosecond to the analysis of their predictive capability or anything remotely concerned with it. Show me an organisation with a “mission statement” and I’ll show you an organisation that does not need to exist. When I was in “college” as in University; not High School; all of the really smart students belonged to “The Society for Independent Intelectuals.” For the entirety of my College days; as far as I am aware, their meeting deliberations consisted of trying to put English Language words to what would today be called their “Mission Statement”. I’m not sure they ever succeeded. And no I was not a member; I wasn’t nearly smart enough to belong to such an outfit; but one of the chaps who did; filled me in on their goings on. So watch out for all the time that is wasted trying to come up with “mission statements.” You know damn well they are trying to come up with some sanitary way of explaining how come they can waste so much money on basically nothing. What man knows, you can write a short paper. What man doesn’t know, would fill an entire library. Buying constituents votes with other people’s tax money also works for me. Until, as Greece found out, trouble starts, when other people’s money runs out. The question I have is which is more chaotic – the Earth or the Universe? The surface of the Sun sounds promising. 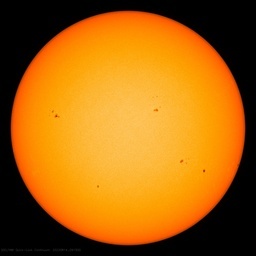 The last round of sunspot counting out of SWPC/NOAA has to be a sore point. Here’s hoping they get some healthy discussion going and come up with something realistic to portray the weakenss/miniscule spots better. Who is NOAA is listening to? Is it my imagination, or is the name of that society just a bit oxymoronic? Don’t get too excited, they just don’t want to be blamed for the BP oil spill mess, hence their dropping of the managing coastal resources tagline. If we had discovered that Earth’s average temperature can be regulated by simply adjusting the trace amount of CO2 in the atmosphere, it would be one of mankind’s greatest accomplishments. But the facts do not support this hypothesis and our understanding of Earth’s climate system is much too rudimentary to be assigning primary driver status to anything. We don’t understand how the sun works, we don’t understand how the clouds work, we barely understand how the oceans work and volcanic activity is a complete wild card. Our understanding of Earth’s climate system is rudimentary at best. We have 130 years of highly suspect surface temperature data and 31 years of reasonably accurate satellite data, on an approximately 4,500,000,000 year old planet. Our understanding of the history of Earth’s climate system and its average temperature is rudimentary at best. Based on our limited understanding of Earth’s climate system, any predictions about Earth’s climate system and the long term trajectory of its average temperature are, at best, educated guesses. We are still learning how to accurately measure Earth’s temperature, much less accurately predict it 50 – 100 years into the future. Those who claim to be able to accurately predict the long term trajectory and likely future state of Earth’s average temperature, are either deluding themselves, or lying. See now NOAA, was that so hard? Now you seem to be more in touch with reality. All you need to do now is to distance yourselves from Mr. Gore’s religion. Something about how it’s difficult to separate anthropogenic influences from natural variability, and that there are far more serious environmental issues facing mankind than that of CO2. NOAA and the Mineral Management Service seem to be embroiled in a finger pointing contest re permits and such for drilling. As I said above, I think their dropping the protecting the environment from their tagline has nothing to do with an outbreak of humility and everything to do with an outbreak of CYA and/or politics. “NOAA’s mission is to understand and predict changes in the Earth’s environment […]” – This is refreshing. “NOAA understands and predicts changes in the Earth’s environment […]” – This was just wrong. Good work Anthony & Others. Bravo. If you are near Rickenbacker Causeway, then skip the press conference and go to the Seaquarium instead- more bang for the buck. Why didn’t they just say, “NOAA strives to understand and predict changes …”? Yes, ’tis true they ay mneed a phoie number for their phooey press conference ….. I noaa nasa when I see one. Ok. Poor attempt at humor. Sorry. Having read that Anthony knows that employees from NOAA frequent this site, I’ll try to be more mindful when I comment. Actually, this might be the first time I actually have something positive to say about NOAA. Well, sorta. I was actually using their sea level maps to explain why global sea level predictions is so misleading and why the media just love stories of gloom and doom. Unfortunately, the information and graphs that I used from NOAA really don’t support global warming and using their own information to further my own research into the matter has been a bit of a struggle for me. There is so much disinformation from governmental websites, that I attempt to distance myself from them. But in this particular case, It really helped me prove a point. Sounds more like a minor adjustment for budget funding purposes. After all, if they already understand, what do they need more research dollars for? The denial of responsibility angle from Severian is good too. Does the Earth’s environment really extend to the surface of the Sun? Well, maybe they should say “environment and environs,” if that wouldn’t be too wordy. Maybe this is why if they can’t get it right in real time how are we to believe? SO IF THEY CAN’T EVEN GET THIS RIGHT WHAT DOES THAT SAY ABOUT GLOBAL WARMING OH MY?? Not yelling well just a little! I think this is why the markets have started crashing? Remember what P.Charles said what was it only 50 days to pass the GW bill to tax the people? When I was a graduate student, I was a research assistant to a distinguished scientist, who always said that there was a huge difference between science and government science. I would include government funded science in that as well. @just the facts. Long diatribe and overstated. Humanity does not need to understand 4.5B years worth of climatology to understand the present. We know climate has changed greatly over those 4.5B years. Do we understand how and why those changes came about – nope. You were correct in that. However, we don’t need to understand those changes to understand the present state. Do we understand the present state completely – nope. I’d wager few climatologists would state the degree of understanding we currently have. They might overestimate. You would underestimate. As usual, the correct is most likely in the centre. The difficulty is planning for the worst while hoping for the best. Twiddling our thumbs about it gets us no where. I also find it interesting that we know a great deal about, and most accept, that volcanoes have a large effect on climate. Yet, when comparisons are made between volcanic emissions and human emissions, human emissions greatly exceed the volcanic estimates. Humanity pumps, day in, day out, enough to overwhelm even the largest volcanic events, yet we concede volcanoes have an effect and we do not. Maybe I overestimate and underestimate. I’ll concede that, but I won’t accept doing nothing about it. “@just the facts. Long diatribe and overstated. Humanity does not need to understand 4.5B years worth of climatology to understand the present. We know climate has changed greatly over those 4.5B years. Do we understand how and why those changes came about – nope. You were correct in that. However, we don’t need to understand those changes to understand the present state. Do we understand the present state completely – nope. I’d wager few climatologists would state the degree of understanding we currently have. They might overestimate. You would underestimate. As usual, the correct is most likely in the centre. The difficulty is planning for the worst while hoping for the best. Twiddling our thumbs about it gets us no where. How can one overstate the facts? When you are completely lost, often the best thing you can do is sit tight, conserve energy/resources and contemplate what’s next. I’m confused by your reply. Your original post had little facts within it. I was not stating the few facts you listed were overstated. I thought I made it clear it was your statements about our level of understanding and estimations based on this understanding that was understated. If people cannot understand this difference, it is not surprising climate science arguments get based on opinion . ‘exercise in futility’ – Are you trying to say we will never understand or explain therefore we should not try? If so, horrible statement. Maybe YOU should stop trying and let those who care, continue to investigate and improve our understanding. Straw man on the twiddling thumbs. Neither I nor you really consider us ‘completely lost’. If you do, then you are wrong – thats a fact. I know that opens all kinds of doors for you to attack me, but I do not care. There’s also some predictive capacity for you to boot. I would agree that in some scenarios it would be good to sit and wait. In this case I do not accept your opinion that this is one of them. We sit and wait and do nothingn MAY result in climactic shifts that at best have limited effect on our lives, at worst threaten human civilization as we know it [this is economically AND ecologically]. However, if we decide to act [better yet, had 20 years ago] the shift away from fossil fuels into a sustainable, renwerable, alternative energy future will bring more reliability, security, stability and diversity. Will there be an economic cost? Absolutely. The effects which are as predictable as climate change. Both rely heavily on models that are reasonably well understood on small scales but more difficult to deal with all complexities. In all, I agree with the fact that chaotic systems are difficult to model and study, both economic and ecological. I also feel our ability to model them is better than you suggest. I restate that sitting an doing nothing may seem like a viable strategy to you but to many of us, it is not. The cost of ecological collapse dwarfs economic costs. I don’t know if you play poker but if you do maybe you can understand that even though your 88 may be a 55/45 favorite over AK, risking an entire tournament on these odds is not the best strategy to win the tournament. Now I can predict that if you know poker, we make the call without risking our whole chip stack to see the flop. Its time for us to make that call. Blah blah blah. Like you, I’m sure you get tired of these same old debates. Who’s right? Who gives a crap anymore. We both need to understand that as much as I see the data and think its a no brainer. I realize others see it in the reverse. I hope the common, intermediate ground is good enough. If you are confused by JTF’s reply, imagine how confused we are by your response. I would argue that every single sentence in my original post is factual. I haven’t come across many little facts in my day, but I would challenge you to select any of the sentences in my original post that you believe are not in fact a fact and I will argue why I think that they are not only my opinion, but also facts. If you (or anyone else for that matter) can demonstrate that any of the statements in my original post are not factual, then I will readily admit my error and make the correction in future posts. The exercise in futility I speak of is in terms making estimates that are highly speculative and/or subjective. Whether estimating Earth’s average temperature 50 -100 years in the future or estimating the exact degree of human’s current understanding of Earth’s climate system, these are exercises in futility, that in no way advance our understanding of Earth’s climate system or further human knowledge. I like how you think you know how I think… In terms of Earth’s climate system, at present, I consider us completely lost. The chances that Earth’s climate is going to do what we expect are essentially nil. Would you agree that this is an astoundingly complex system? Is that what you consider ‘astoundingly complex’? to the point of believing we are unable to understand, quantify and model? I’m surprised. As for thinking what you think, I have no idea what you are thinking. And any presumption I make might make you state further to which degree I don’t know what you are thinking. So I won’t presume to think what you think of my thoughts on your thoughts. Got it? Clearly you think your thoughts and I think my thoughts and perhaps never the twain shall meet – or perhaps they might. Would you agree that these are both significant variables in Earth’s climate system and have a significant impact on its average temperature? I absolutely consider Earth’s climate system astoundingly complex. There are a plethora of variables, many interdependencies, an array of feedbacks, both positive and negative, and its all continuously evolving. What other systems share similar complexity, the global economy, highly complex organisms, galaxies, etc.? I am not saying that “we are unable understand, quantify and model” Earth’s climate system, I am saying that at present we are in the early stages of this process. It will likely take generations of research to fully explore and understand Earth’s climate system, and even then models will struggle to effectively predict its future behavior. The biggest challenge for the models is the continuously evolving nature of Earth’s climate system, i.e. each future event can fundamentally alter the equation, such that long term predictions must rely on assumption upon assumption, any of which could be incorrect. I am completely open-minded, and other than shouldering the potential costs of limiting anthropogenic CO2 emissions, I have no horse in this race. I am receptive to arguments supporting the need to limit anthropogenic CO2 emissions and will give them reasoned consideration. I am a pretty good barometer of logic and reason and if you and your peers cannot convince me of the merits of your viewpoints, chances are that you and your peers are going to lose this argument on a global scale.